Someone at Vinnies is very smart. 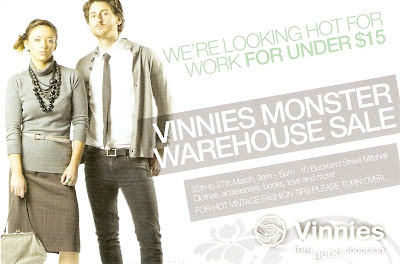 They've timed Vinnies' next warehouse sale in Mitchell for the same days as the Lifeline Bookfair at the Showground. TOF and I sampled the delights of Queanbeyan's four op-shops today. All but the big Salvos Family Store had half price sales. Little Salvos had half price on everything; Vinnies, half price on most stuff and Bargain Hunter, half price on summer clothing. We didn't buy as much as you might expect. A pair of brogues for TOF and a vintage cotton sheet which may or may not become blouses and/or a skirt next summer. Still for $5 the lot from the little Salvos, we were happy. Just a reminder about the up and coming Fash 'n' Treasure Market on Saturday 5th March. This fashion market began in 2010 and is a place where Canberra locals can sell their second-hand clothing, shoes, handbags and accessories. The market also has a section for professional fashion sellers - they have a range of retro and vintage traders along with local fashion designers, modern retailers, milliners and so on. There will be over 90 fashion traders and it should be a fantastic day with lots of hidden fashion treasures to be found! 2011's first market runs from 10am to 4pm at the Old Bus Depot building in Kingston. There'll be change rooms and a professional DJ for the whole market. Entry to the market and parking is free. More information is available on their website. We assume this starts at 9am. I made a visit to the Y shop in Belconnen, and discovered that they are having a Half Price Sale. The ladies behind the counter said It goes until this weekend, but if they do not shift enough stock, then it will continue next week. Also this sale is only at their Belconnen store. I've taken the liberty of posting Miss Elle's comments from one of last week's posts about her weekend haul because not everyone subscribes to the comments and I thought you'd enjoy it. It was so fortuitous that I logged on yesterday- I didn't know the St Ninian's sale was on and that's the sort of op shopping I love, poking around for some finds. Oh, I dream about the finds! I found some fantastic 80's gear. I am having an 80's dinner party and picked up a marvellous wrap button at the waist, shoulder padded dress- very Ashes to Ashes. I also observed another with an envious bounty- Lacoste skirt, tapestry bags, beautiful black suede pumps. Hope you don't mind Miss Elle. We'd love to se pics of your party. St Ninian's at Lyneham is having one of its clothing sales. We've got many a bargain at these sales at very reasonable prices. Picked up a Liberty blouse a while back for $1.50 and ran into a weaver buying denim clothing by the bagful. Price list from last March is on this post to give you an idea. Spotted. Garage Sale. St David's Red Hill. 26th February. Thanks to my colleague, E, for grabbing the details of the Salvos shop in Cooma last weekend. Opening Hours: 9.30 am-4.00 pm Monday - Friday. We've been to this corker of a shop a few times now, and I recommend it for bric-a-brac, vintage manchester and crafty goodness. Clothes, not so much, but great if you are a slim skier. I suspect the opening hours change with the season - we'll keep an eye on this one. Anyone else been to their favourite oppie recently and can update the opening hours? With an elegant home full of eclectic, antique gems, Red Hill dressmaker and bargain hunter Teresa Zarlenga says she would never walk into a shop and buy something new. "I can't imagine anything different in my home," she says of her collection of timeless, classic furniture and accessories, or "co-ordinated rubbish", as she calls it. "I'm not interested in going into a shop - all the furniture there seems to be the same. "I'd much rather have something with history that has just happened to come my way. It means so much more to me." "Teresa says she loves the thrill of finding an item, be it an elegant chaise, a painting, a hostess trolley or a nest of tables that perfectly match her "look" and the feel of her home - particularly when it sets her back around $5." 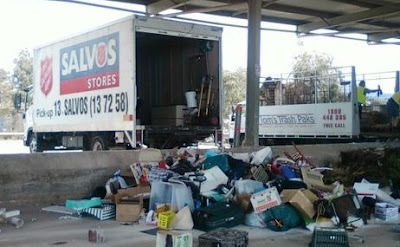 The RiotAct.com has had a recent story about a Salvos van being seen at a Waste Transfer Station (aka Tip) dumping a heap of unwanted donations. The comments by some rioters said they consider the Salvos should be a salvage operator, rather than a charity shop*. The question is, do we, as dedicated op-shoppers agree with these views? Is this the thin edge of the wedge, and Salvos and other shops be forced to sort through our rubbish. Or is this the line in the sand? Let's consequences of these options. If charity shops are forced to deal with our rubbish, they will have to either get more volunteers, which is highly unlikely as volunteers are a fickle workforce. Who wants to volunteer to sort through rubbish, when I can volunteer somewhere else, where I will not be faced with dirty underwear, nappies and syringes. If they cannot get volunteers they will be forced to employ more staff, and if they are a shop that subsidises their churches welfare arm, then this will cut into their revenue, when it is increasingly needed. 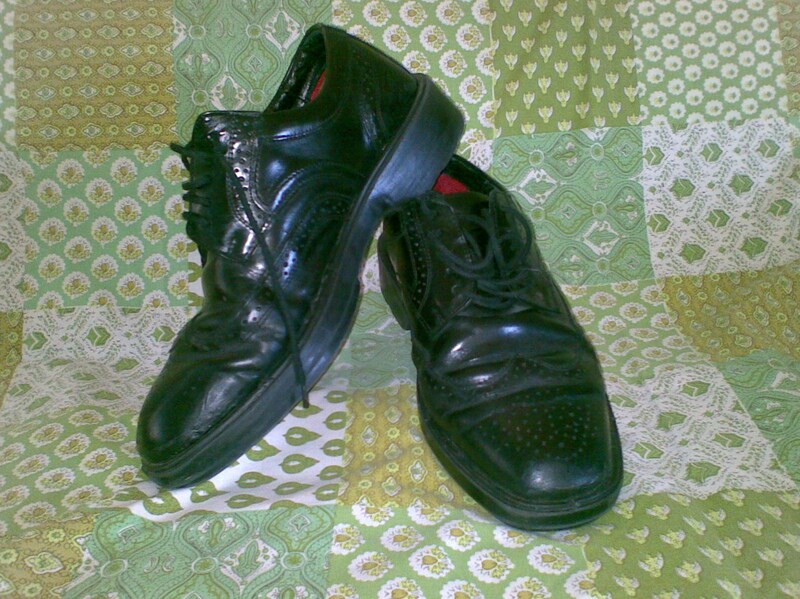 (*I know they run themselves on a business model, have paid staff, etc, but they are still a charity shop. 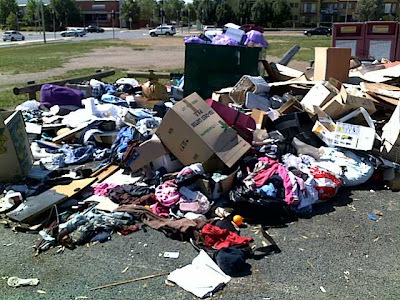 **While i stood at the Gungahlin Dump taking this photo, a car drove up, I was shaking my head at this pile of rubbish. The driver got out, and I said that rather than leaving her donation there, she could take it to the nearby Salvos or Vinnies during business hours. She said she was unable to get there, and proceeded to shove her bag of clothes into the top of one of the donation bins. A whole new level of thrift Chez TOF. A question in comments today asked for opening times. I muttered crossly about checking the database for themselves only to have to take it all back - the information wasn't there. Vinnies Tugg is open today 10-3, Anon *sheepish smile*. I'll update that one now, but I have a challenge. Next time you visit your favourite oppie, would you note the times and upload it as a post, please? I'll glean the data and amend the database as necessary. Wide variety of second-hand and near-new books. Fiction and non-fiction at bargain prices. $5 bags clothes $10 boxes books.